Shopping for Doctor Who Action Figures? Daddy, where do Daleks come from? Retro-styled action figure from the "Genesis of the Daleks" serial of Doctor Who. Features wheels, rotating head, and movable "eye stalk," gun, and "plunger arm"! Order yours now... or face extermination! Is that a Genesis Dalek? 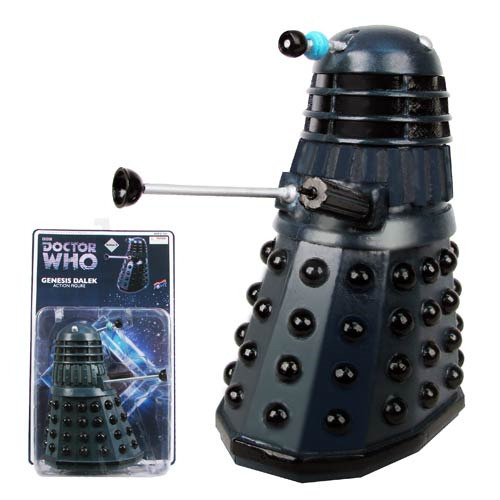 Grounded in the "Genesis of the Daleks" serial of Doctor Who that marked the first appearance of Davros, the creator of these evil mutant cyborgs, this extraordinary Dalek 8-Inch Scale Action Figure stands approximately 7-inches tall. With Bif Bang Pow! 's famed retro styling that takes one back to the bestselling figures from the 1970s and 1980s, it features rolling wheels, a head that rotates 360 degrees, an "eye stalk" that moves up and down, and a gun and "plunger arm" that swivel up and down and back and forth! Order yours now... or face extermination! Produced by the BBC, Doctor Who is the longest-running sci-fi TV series in the world. The award-winning show presents the adventures of a time traveler known simply as "the Doctor." Along with his companions, this mysterious Time Lord journeys through time and space using his TARDIS, which appears from the outside to be an ordinary police phone booth. Ages 14 and up.